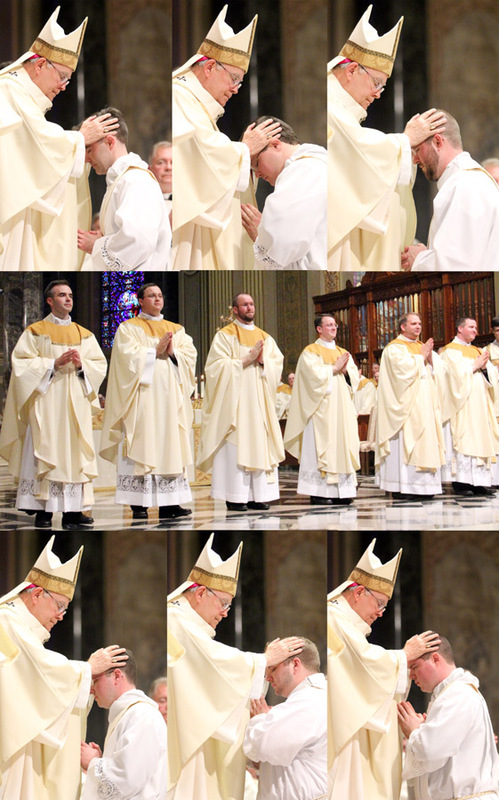 Archbishop Charles J. Chaput ordained six men to the priesthood for the Archdiocese of Philadelphia on Saturday, May 17, at the Cathedral Basilica of SS. Peter and Paul. The Rite of Ordination during the Mass included the promise of the elect, litany of supplication, laying on of hands, prayer of ordination, investiture with stole and chasuble, anointing of hands, handing over of the bread and wine and fraternal kiss. The newly ordained priests are Fathers Jason E. Buck, Sean P. English, Robert M. Gross, Christopher C. Moriconi, Charles J. Ravert and David A. Walters (shown above clockwise from top left). Following the Mass, the newly ordained priests were given their assignments to a parish in the archdiocese — see the list of assignments here — where they will serve as parochial vicars and assist the pastor of the parish.